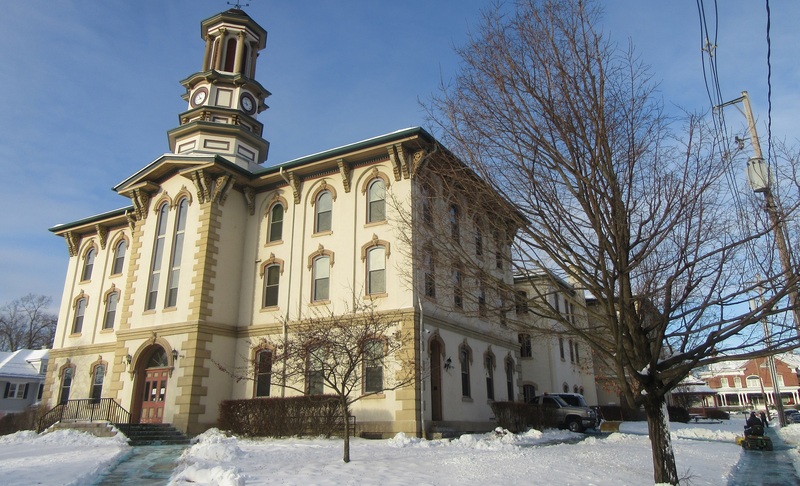 Sidewalks around the Wyoming County Courthouse in Tunkhannock were still being cleared on Tuesday after a weekend snow and ice storm. The storm did not produce as much snows as expected, and county officials did not deem it necessary to declare a State of Emergency. The Wyoming County commissioners announced at their regular monthly meeting on Tuesday that are sending a written request to Gov. Tom Wolf’s office, asking that the election for someone to replace Tom Marino, who resigned from his leadership of the 12th congressional district in Pennsylvania two weeks after being sworn in again, be held concurrently with the spring primary election slated for May 21. The primary reason cited is the cost. “This is a real burden to the counties,” said Henry, who related that the County Commissioners Association of Pennsylvania (CCAP) had drafted a letter that has been approved or is under consideration in neighboring Sullivan, Bradford, and Susquehanna counties, which was confirmed by commissioners there. 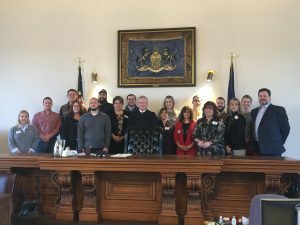 Sandy Ritz, a member of the Wyoming County Republican Committee noted that Republican and Democratic officials within the 15 effected counties have been charged with appointing nominees, and the governor would soon be setting the date for the special election. She felt that it would be unlikely that the governor would comply with the requests from county leaders, but Henry maintained that it is worth the effort. The cost to tax payers for the special election in Wyoming County alone could exceed $40,000. Local tax collectors are supposed to file their reports with the county tax claims bureau each year by January 15, according to tax claims director Patricia Mead. But three are notoriously late and, this year, two additional collectors have yet to file. Because of this, citizens coming to the courthouse in good faith to make delinquent tax payments have to be turned away. “We have to wonder if we’re ever going to see them again,” said Mead, who submitted a proposal to the commissioners on Jan. 22 requesting that a $20 fine for each day beyond Jan. 15 be imposed on the municipal tax collectors. In some counties, she related, such fines are as high as $45 per day. “Unfortunately, this happens often, and it has gotten to be an issue,” Henry remarked, adding that he would be willing to approve the requested fines so long as the process is approved by the county solicitor. Wyoming county president judge Russell Shurtleff made an announcement at the beginning of the commissioners meeting that he did not yet have a nominee from the Wyoming County Democrats to confirm for the vacancy resulting from the death of commissioner Ron Williams. He related that a late applicant had stalled the process, and he expects to have a name for consideration by Friday. William Jaquish was reappointed to the Wyoming County Airport Authority and will continue to serve as secretary for the three-member board. The municipal airport in Eaton Township is privately owned, but the Authority serves as the communicating body for the county in the event of an emergency, or when high ranking officials ask to use the facility. Jaquish, a license pilot and airplane owner, has been on the board for seven years. The 2019 Leadership Wyoming team (above) recently met for Government Day, which afforded members tours of the Wyoming County courthouse and the county’s Emergency Operations Center. A meeting with public officials was conducted, and the county’s response to the opioid epidemic was outlined for approximately 20 participants in the program, which is sponsored by the Wyoming County Chamber of Commerce. Other speakers included Judge Shurtleff, human resources director Mike Donahue, district attorney Jeff Mitchell, EMA director Gene Dziak, and Young People in recovery chapter lead John Fabeseski. A moment of silence was observed for Paul Shaffer, who served for 10 years as chief of Triton Hose Company in Tunkhannock. Shaffer, who was also a veteran of the US Marine Corps and worked for 36 years at Commonwealth Telephone Company, passed away on Jan. 20.